Chase Bean, vice-president, Tnemec, and Al Bakawi (right). 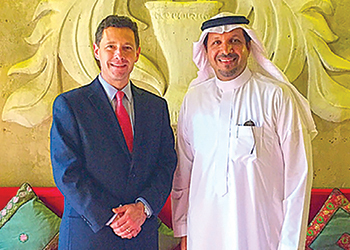 Tnemec coatings, which have gained popularity in the region particularly because of their superior corrosion resistance, will soon be manufactured in the Gulf region. Saudi-based Gulf Horizon, which has been the official distributor of Tnemec products in the GCC for the past couple of years, will start production of these coatings at its new factory in the Dammam Second Industrial City during the first quarter of 2016. 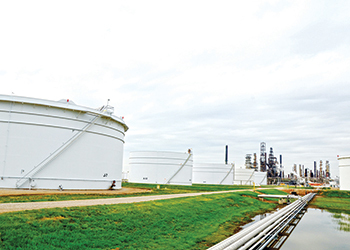 Tnemec’s protective coatings include products for fuel storage and chemical containment, thermal insulation and concrete coatings, as well as coatings for durable exteriors. Tnemec coatings ... suitable for tanks and petrochemical industries. According to Al Bakawi, the coating systems provide extreme durability, corrosion resistance and enduring performance and have been providing protection to a wide variety of industrial structures. “With these coatings, we are targeting the corrosion control, sewage treatment, severe waste water management segment as well as all types of tanks and the petrochemical industries,” said Jaffer Shaikh, general manager of Gulf Horizon. Gulf Horizon has already added a number of key clients to its portfolio including Saudi Aramco, Saudi Basic Industries Corporation (Sabic), and Marafiq, and is keen to participate in the major infrastructural projects being undertaken in the region. “Tnemec and Gulf Horizon look forward to a bright future, supplying innovative coatings to the most demanding projects in the Middle East,” Al Bakawi concluded. Established in 1991, Gulf Horizon has expanded its business portfolio to various market segments including trading, contracting, petroleum services, project management, advertising and information technology. It has offices in Al Khobar and Riyadh in Saudi Arabia and plans to set up operations in the rest of the GCC in the near future.